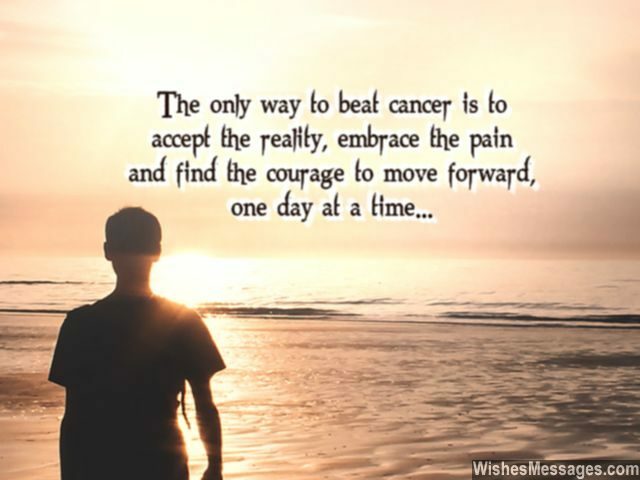 Inspirational Quotes for Cancer Patients: This post is a reverberating mix of motivational quotes and notes that highlight the importance of hope in the treacherous journey of recovery from cancer. The nasty disease brings life to a complete stop. Patients need every ounce of support, love and encouragement from friends and family. If you know someone who is fighting cancer, use reassuring words to give them the strength and the will power to endure the pain and the suffering. Sweet texts, Facebook posts and shares on Pinterest – keep poking them with inspiring messages and survival stories. The positivity that you infuse in their lives can sometimes be more powerful than chemotherapy itself. 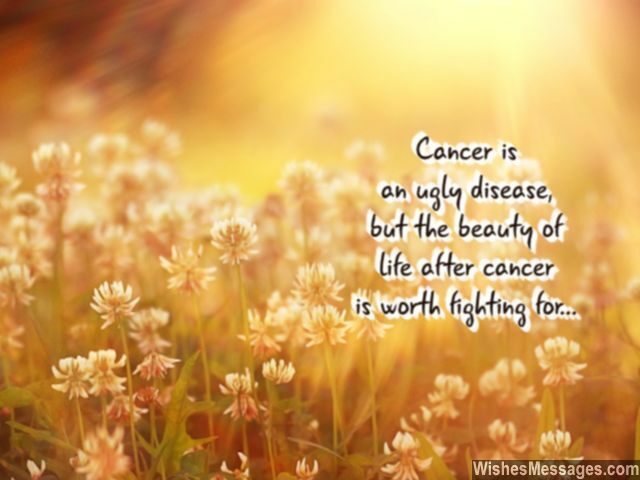 1) Cancer is an ugly disease, but the beauty of life after cancer is worth fighting for. 2) No matter what happens now, always remember that you are a survivor, not a victim. 3) Fill your veins with medicines, fill your heart with love, fill your mind with determination and fill your soul with hope so that cancer has no place to stay in your life. 4) Your strength to suffer pain today will be the pen that writes a new destiny. Just one month of being cancer-free will wipe away the pain of many years of chemotherapy. 5) HOPE is the bridge that connects CANCER and RECOVERY. 6) The only way to beat cancer is to accept the reality, embrace the pain and find the courage to move forward, one day at a time. 7) The beginning of mind over matter is the beginning of the end of the cancer within you. 8) A lot of cancer patients feel that when people talk about hope and courage but they really don’t know what it really feels like to be weakened from the core. The drugs and the chemo rip into your body and bring you down to your knees. The pain is constant and the suffering is consistent. But wait, it gets worse. The side effects, the scars and the trauma of being a cancer patient feels as if a piranha is eating away tiny bits of flesh day after day until it reaches the bones. Can you relate to this? Good, now that you have experienced the worst that life has to offer, it can only start getting better from here on. This is when you will truly realize what HOPE and COURAGE mean. 9) The difference between a bad and a good attitude is the difference between a bad and a good recovery. With cancer, attitude is everything. 10) Being a cancer patient is like hitting a wall every single day. The only way to the other side is to become stronger until you can break the wall apart with your bare hands. 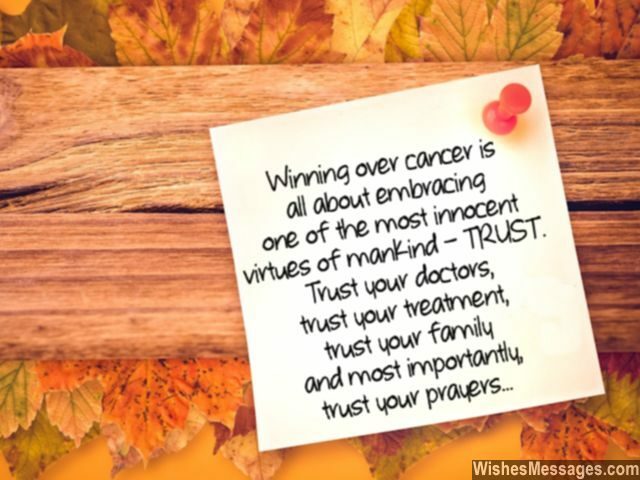 11) Winning over cancer is all about embracing one of the most innocent virtues of mankind – TRUST. Trust your doctors, trust your treatment, trust your family and most importantly, trust your prayers. 12) If your WILL TO LIVE is INSPIRATIONAL and your FIGHT is MOTIVATIONAL, your RECOVERY will be SENSATIONAL. 13) Stop wasting your time thinking about how unlucky you are. You will get a lot of time to think about cancer once you recover. For now, start making the most of your time by thinking how courageous you are. Fight on my friend, get well soon. 14) The only way to beat cancer’s UGLY side is to overpower it with the BEAUTY of Hope. 15) Winning over cancer is all about leaning on your loved ones more than you lean on to medicines, and holding on to hope more than you hold on to medical reports. 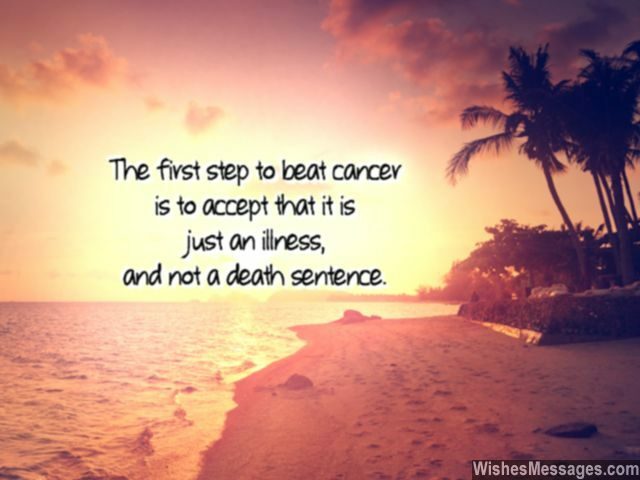 16) The first step to beat cancer is to accept that it is just an illness, not a death sentence. 17) The fight with cancer isn’t easy, you knew this from the start. Now all you have to do is truly believe that you will recover, from the bottom of your heart. 18) Life after cancer: Eat, travel, read, laugh, have fun, cuddle, kiss, dance, exercise, work, play, write, run, sleep, ride, flirt, celebrate, love, smile, cook, hug – yes, it is all worth fighting for. 19) Being a cancer patient is all about rearranging just one word. Instead of thinking WILL I SURVIVE, you must say I WILL SURVIVE. 20) As a cancer patient, think of yourself as someone who got stuck outdoors in a hurricane. Yes, the battle for survival will be tough but there is beautiful sunshine waiting for once the mammoth storm passes away. 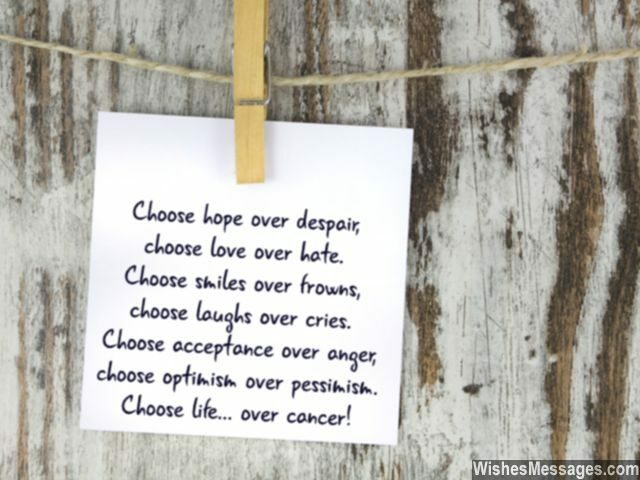 21) Choose hope over despair, choose love over hate. Choose smiles over frowns, choose laughs over cries. Choose acceptance over anger, choose optimism over pessimism. Choose life over cancer. 22) Don’t be under the impression that people can truly understand the journey you are going through as a cancer patient. You are all but alone on this nasty road. All your friends and family are praying for you, cheering for you and desperately waiting for you at the finish line. Fight for it, go for it. 23) Once diagnosed with cancer, life becomes quite simple and comes down to just two choices – give up or fight back with everything you’ve got. 24) Do you know what Lance Armstrong, Sheryl Crow, Sharon Osborne, Ann Romney, Christina Applegate, Robin Roberts, Olivia Newton-John, Kylie Minogue and Robert De Niro have in common? They are all celebrity cancer survivors – living examples of how people have beaten cancer and lived life to the fullest afterwards. 25) Being a cancer patient is not about TRYING to beat the odds. It is about knowing that the odds will beat you if you don’t GIVE IT YOUR BEST. 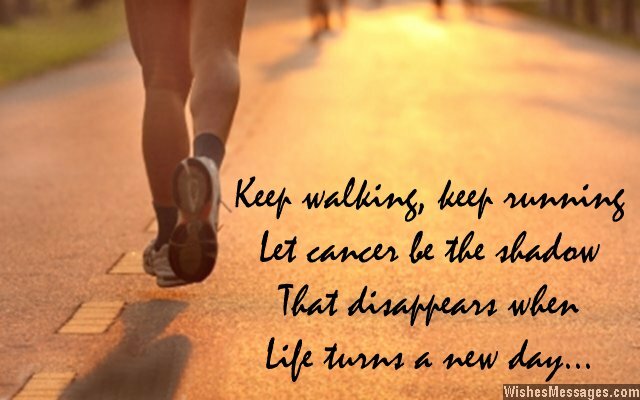 26) Keep walking, keep running and let cancer be the shadow that disappears when life turns a new day. 27) Cancer isn’t always a DEATH SENTENCE. All you have to fight it out in the court of LIFE with HOPE, DETERMINATION and COURAGE. 28) The battle with cancer is long and hard, but this is one battle you will be glad you fought. 29) Cancer is a shipwreck but there are lifeboats called HOPE and COURAGE waiting to take you back to the mainland. All you have to do is swim to them and then paddle with all your heart. 30) There are two steps to cancer. Accepting that you have the disease itself is a big task. Then comes the harder part, the will to move on. Essentially after all the chemo, all the drugs and all that has been said and done, it all comes down to these two simple steps – Acceptance and Moving On. 31) No matter how dark a night, it must be followed by dawn. 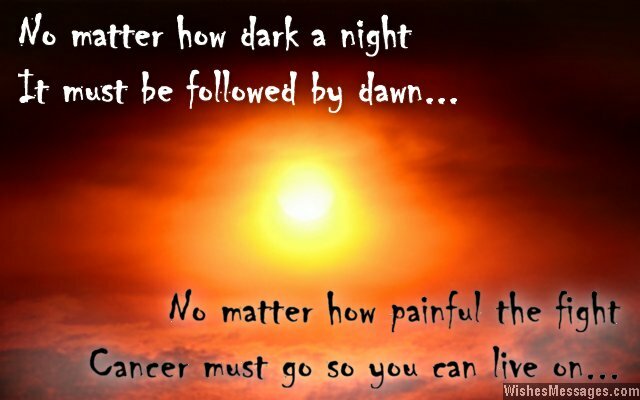 No matter how painful the fight, cancer must go so you can live on. 32) If cancer can’t break you, nothing can. If cancer can’t kill you, nothing can. If you can have the courage to fight cancer, you will have the courage to fight anything. 33) You can’t run from fear, you can’t escape it. But you can choose not to be afraid of fear, by having the courage to face it and move forward. 34) The battles of a cancer survivor go down in the books as inspiration and motivation for many other people. You may have been diagnosed with a life-threatening disease, but you have also been given the chance to become a legend. 35) Just because life is pinning you down right now doesn’t mean it won’t let you fly later. Just because cancer is beating you up right now doesn’t mean you won’t beat it later. 36) Don’t let life DURING cancer be a regret about the way you lived life BEFORE cancer. 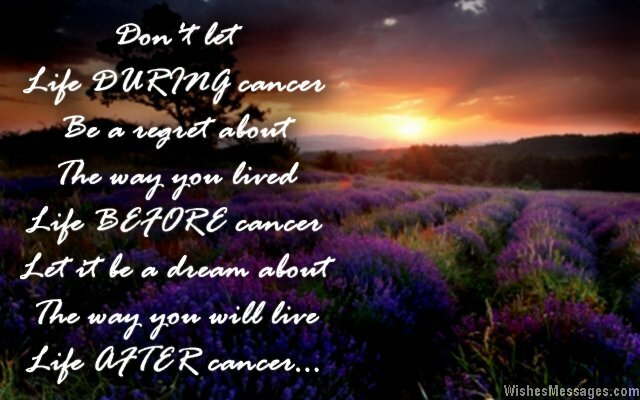 Let it be a dream about the way you will live life AFTER cancer. 37) Out of the many good things that will come out of cancer, one of the best is that you will know which people really care about you. Use this as motivation to recover as fast as you can, so that you can get out and spend more time with them. 38) After your treatment and recovery, the painful scars left by cancer will be your life’s biggest source of inspiration. 39) How would it feel if you were to be born with the memory, wisdom and experience of an adult? That is exactly how you will feel when you will be born again after recovering from cancer. 40) Doctors can give you all the treatment they want but the real healer is your will to survive. Gather every ounce of hope and tell yourself every day – ‘I have moved a step closer to recovery’.